blacklilypie: This is the guy that killed her. This is the guy that killed her. This guy. This is the sewing machine murderer. 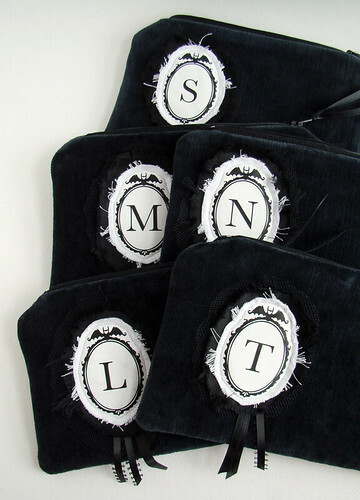 Monogram pouches with a little bat frame. Only the 'M' is currently listed for sale, but there are more letters available. I actually made a little batch of them. Whenever I sew I try to do a bunch at once because I always loose my zeal for it halfway through and then don't want to sew again for months. These are the letters that made it through to pouch form ('B' got screwed up and 'A' was somehow lost...) I will be posting them in the shop in a lazy and haphazard manner in the next day or so. I have to fight with every photo in Photoshop to try and make the black on black details show without washing out the blackness. Its *challenging. * Things always look fine on my screen then I upload to Etsy and it looks like crap. I think I will try some more monogram items this weekend. I totally love how it looks. Expect some sort of monogram bookmark (yes!) or pin set (hmmm.) I will have to test drive a few designs. What letters should I do? These are very neat! You should definitely find that "A" and do one. Just found your lovely shop in etsy. I'm looooving your cutsie and cool stuff. 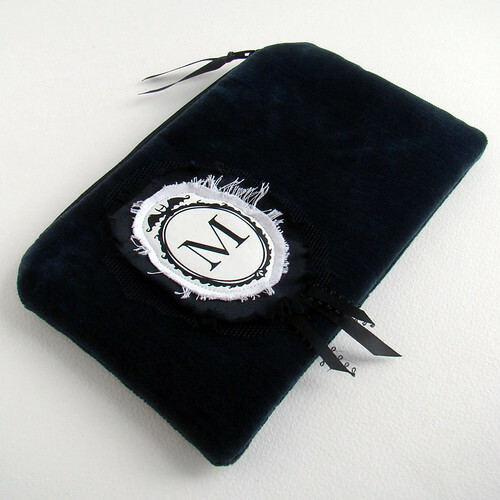 Too bad that there aren't any of these letter pouches left in your shop. It would have been so cool a present for my vamp-literature loving sister.